I first saw the colored turtle signs in 2005 when I was working in the woods north of the Miramichi. The signs were on either side of the road just before the bridge that crosses the Nepisiguit River north of Heath Steele Mines. I asked everyone I could about the signs. My father told me he thought they were marking the Mi’gmaq Trail. 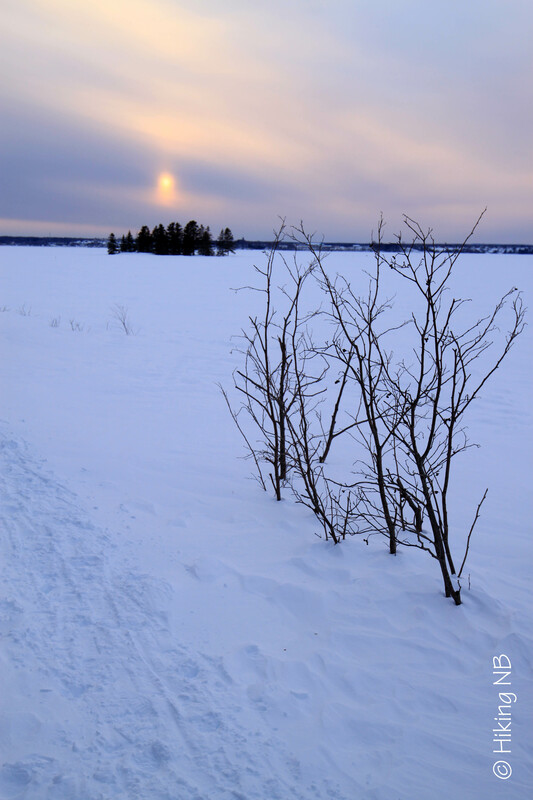 An ancient Native Portage Trail that follows the Nepisiguit River all the way from Bathurst to Mount Carleton Provincial Park. I called Pabineau First Nations and they gave me a contact who had more information about the trail but no one had much information. It seemed like there was a big plan to develop the trail but the project lost steam. You get the same sense when you read the trail section descriptions on the Mi’gmaq Trail website. The website itself hasn’t been updated since 2011. I have thought about this trail many times over the years and I thought today would be a great time to start exploring. After a stop at Tim Hortons to get some much needed coffee we started our drive north. The roads were surprisingly clear considering the amount of snow and winds we had received in the last few weeks. When we reached Heath Steele Mines there was some drifting on the road. Trucks had gone through the drifts but I had a car. A small car with about half the clearance. We had come this far so we decided to try for it. We backed up to get some speed and raced through. The car pulled sideways a bit on our way through but we exploded out the other side just as we started losing speed. We made a better trail for the next guy but we also knocked a small aluminum plate loose on the bottom of the car. A small price to pay for an adventure. The road was clear past Heath Steele Mines. 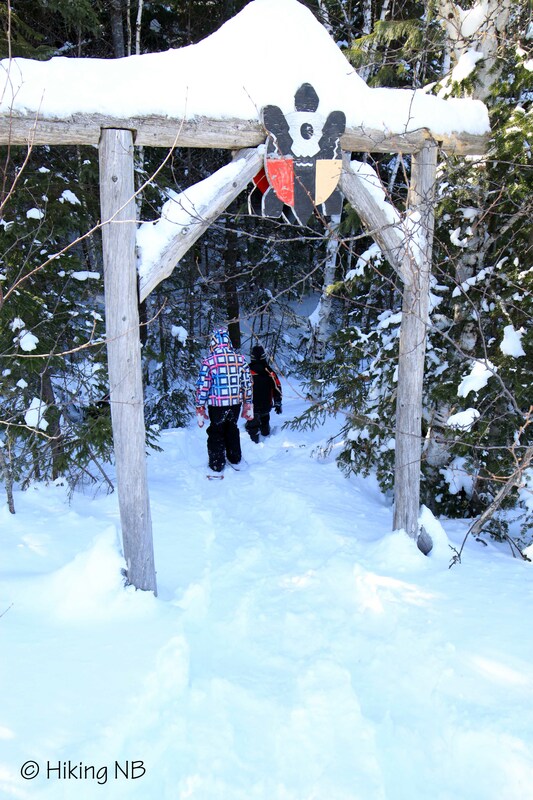 When we reached the bridge over the Nepisiguit we slowed down and looked for the Mi’gmaq Trail signs. We didn’t see any so we crossed the bridge and looked on the other side. We crossed back over the bridge, parked and got out. We were looking around for the signs when we noticed a trail sign on the west side of the road right beside where we parked. The snowbanks were so high that you could barely see the 8 foot sign. 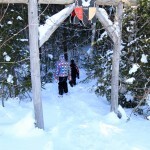 We got on our snowshoes, climbed up over the snowbank, then began to descend the trail. There were intermittent orange ribbons marking a trail down towards the river. We criss-crossed the orange ribbons down the hill and eventually emerged on the shore. We didn’t see the ribbons continue so we surmised that the ribbons may have just been a trail down to the river. We will have to return in the summer for further exploration. There was a band of open water along the shore. It came from a stream that came out of the woods not far above where we were. On the other side of the open water there was a large ice shelf about 5 feet thick. We climbed up on the ice shelf down river from the open water. 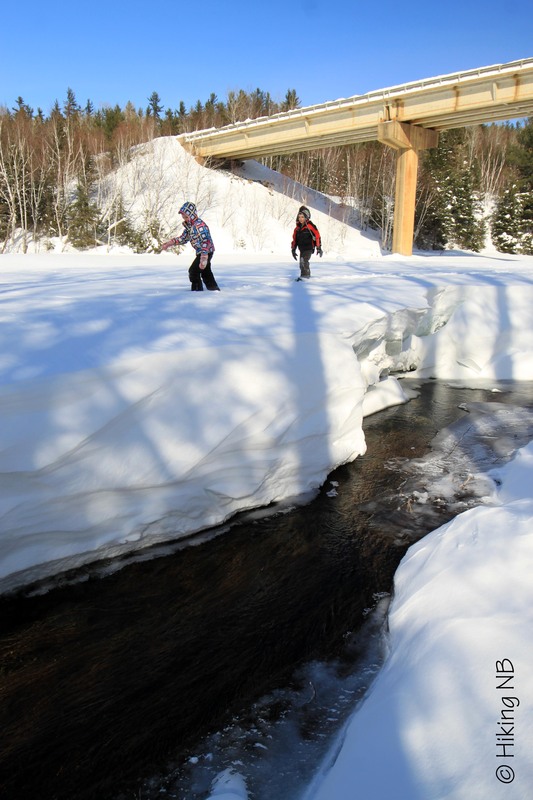 We explored the ice for a bit along the shore and then decided it would be a good idea to climb the steep hill under the bridge to get back to the road. 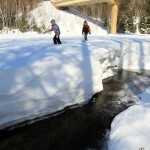 The kids took their snowshoes off to keep from sliding. When I did the same I sunk in the snow up over my knees with every step. This was more of a workout than I was expecting for the day but I eventually rolled off the snowbank and back onto the road. We continued on route 430 towards Bathurst. The kids enjoyed when we hit a few woopdy-doos in the road that sent the car into a bounce. There isn’t much radio reception in this area so the kids found some music that sounded like it was French Cuban. We cranked it up and danced, and eventually arrived at a junction. Turning left would take us to Bathurst. Turning right would take us to Nepisiguit Falls. I knew there was a hydroelectric dam at the falls. On Google Maps it also looked like there was a residential area on the road to the falls. It is one of the few places in the province that I had not yet been so we decided to go check it out. We drove through a stretch of camps and houses on the way to the dam. There were several people out shoveling off their roofs. We drove down by the dam and took a look from behind the fence. It looked like an interesting place to return to in the summer. The maps from the Mi’gmaq Trail website showed that the Trail followed along on the opposite side of the river at the dam and ended down river at Pabineau Falls. There was supposed to be a bridge built near Pabineau Falls to cross the river and access the trail. I am not sure if there is any other way to cross the river near the Pabineau but it is something else I wanted to come back and explore in the summer. It was only mid-afternoon when we reached Bathurst so I gave the kids a choice. We could either go to Tetagouche Falls, Pabineau Falls or to Daly Point Nature Reserve. Once I reminded them that Daly Point was where the chickadees landed on your hand it was easy for them to make a decision. We drove all over Bathurst looking for a bank machine and a place to buy sunflower seeds. The aluminum plate that was dragging on the bottom of the car made a loud sound on the pavement and turned some heads. You can get bird seed at the Daly Point Center but I wasn’t sure if it was open and we wanted to be sure. We then drove back across town to the Reserve. The kids were so anxious to see the birds that they climbed the snowbank and went over to the bird feeders behind the building. I convinced them they would have better luck down in the woods where the food wasn’t so abundant. My son and I put on our snowshoes but my daughter just walked. The snowshoe trail was well packed and she had no trouble. The kids checked out the lookout tower near the Salt Marsh Trail then we returned to the Woodland Trail. We had luck on this trail in the past. We found a group of marauding Chickadees about halfway through the trail. They kept the kids busy for about 20 minutes or so while I took pictures. When the birds slowed down (probably because they were full) we continued on the trail. We found a few more birds at the junction of the Woodland Trail and Warbler Trail but by that time the kids were starting to get cold. We continued out to the Salt Marsh Trail and returned along the bay. 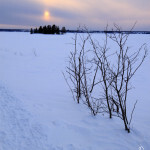 The kids played in the large snowdrifts along the trail on the way back, while I took pictures of the bay and the small clumps of trees in the salt marsh. The sun was setting behind the clouds and created a fuzzy glow that added to the compositions. We met a couple of guys with a camera and a tripod also taking pictures of the sunset. I stopped and talked to them about photography and camera equipment (something I don’t get to do very often). 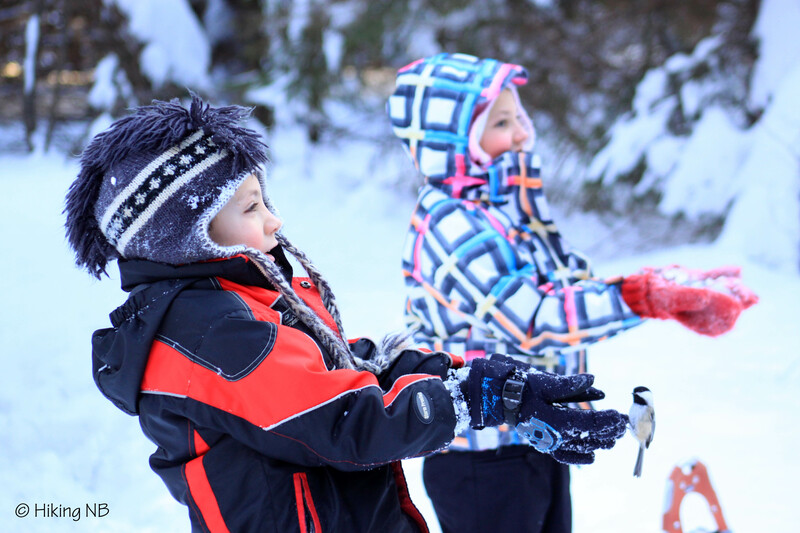 After a few minutes the kids were getting restless because they wanted to get back to the car and warm up. We snowshoed back to the car. After another quick stop at Tim Hortons we started the 45 minute drive back to the Miramichi. On the drive home I thought about the Mi’gmaq Trail and it’s history. We traveled along in our warm car at 100 km/hour on a paved road. A contrast to how it would have been thousands of years ago when the natives traveled in the elements, at a much slower pace by snowshoe, on ancient trails. The short drive from the bridge over the Nepisiguit to Bathurst would have taken days. This made me want to return and explore the trail again next summer and try to learn more.